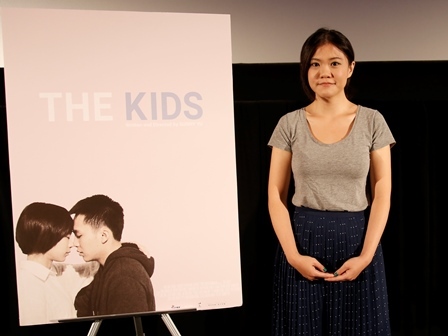 Sunny Yu: I am pleased to see that so many people have stayed with us for the Q&A session of the second screening of The Kids. I hope you have enjoyed the film. Q: I found the film interesting because of its sense of tension and the use of flashbacks. Considering the flow of the time in the film, I had a doubt whether the kid really belonged to Bao-li or not. The characters never talk about it in the film. Will you explain your intension? Sunny Yu: Yes, I get the same questions all the time. I want to make it clear that the kid is Bao-li’s. In the film, it doesn’t clearly say that the kid belongs to Bao-li, that is the reason why many people have misunderstood it. But the kid belongs to Bao-li. This is implied in the scene towards the end of the film where the couple holds the baby in their arms and faces the future. Q: I felt the difficulty of the teenage parents making a living and understood that the issues were similar for both Japanese and Taiwanese people. The restaurant boss’s wife’s friend offers to adopt the baby in the film. Was she selling the kid to the childless American family for a living? Or did she really wanted to adopt and raise the baby? Sunny Yu: It isn’t clearly told whether Chang Qing who returned to Taiwan from US really wanted to adopt the kid. She is a friend of the restaurant boss’s wife. She offers her help just out of courtesy. She is unable to bear a child herself and believe she can provide the best condition for the adoption of the kid. She is offering to help the unmarried or young teenage couples who are unable to take care of their children. Q: The movement of the handheld camera scenes depicting emotions of love, doubt and anxieties in the film made the story exciting for me. Furthermore, the fixed camera scenes towards the ending allowed the strong pull back which really worked for me. Can you let us know about your experience during the shooting of the film and about the film budget? Sunny Yu: This was my first feature length film. Therefore we had to face various problems. We shot this film with a very tight budget. Most of the crew who participated in this film were my friends who I knew from the time when I was working as an assistant director in other film productions. They worked with low wages but the working hours were long. I truly appreciated their efforts and felt sorry for them. As I said this was my debut film, all the difficulties that I encountered were new experience for me. Q: Did you have any ideas on when to choose the handheld and when to use the fixed camera? Sunny Yu: I like the style of the hand-held camera and used it to shoot the part in the film that depicted the present. I wanted to focus on the characters and draw out their emotions. I have used the fixed camera for the reminiscence scenes to show to the audience the beautiful past of the two characters using the dreamy images. So I adopted the hand-held camera style for the scenes depicting the present and fixed camera or fixed camera on rails for the flashback and the past. The distinction of present and the past was the differences in the use of the camera technique. Q: The poster was wonderful. It gave me a very simple and clean impression. What was your intension to design the poster so simple and clean? Sunny Yu: The poster was in fact designed and created by the Executive Producer Alvin Chen and myself. Because the budget for the independent film was not very big, we had to take care of everything by ourselves. When we were officially selected by the Tokyo International Film Festival, we decided to try designing and creating the poster ourselves. I actually liked this poster a lot as the clean and simple design with blank space allows the audience to imagine how the story will unfold. Q: Will you let us know something about the cast？ I liked the main cast, especially the heroin which reminded me of Kwai Lun-mei. Sunny Yu: The main cast are Wu Chien Ho who played Bao-li and Wen Chen Ling who played Jia-Jia. I met them at the time when they made their film debut. We have known each other for 5 to 6 years now so we are very close. They have been playing various parts in many films made for Taiwan New Cinema. Both actors have potentials and are the most anticipated stars of the future. It is the first time for Wen Chen Ling to take the main role in a feature length film. She has experienced several supporting roles for various films in the past. I am very satisfied with their performances in this film. Q: The final scene which ended with a reminiscence was delightful. However, the two characters were left in absolute despair in scene prior to the ending. Were you intending to depict the reality of the issue? You could have given some rays of hope in the end if you wanted. Sunny Yu: Yes this is exactly what I wanted to express in the film. I wanted to bring the hope to the young couple in the end. Though the reality has torn the couple apart and they were experiencing the absolute despair; they used to love each other so much and had felt no fear of future. They could always move forward as long as they stayed together. I ended the film in this way with a hope that they could start everything over again just like before and face the challenging future together. Q: The film had a straightforward narrative and was exciting. The mother liked gambling and seemed like she never worked for a living. How could she raise the child without working for a living when her husband has already passed away? Sunny Yu: When I established the character profile, the role of the ‘mother’ worked in a factory or engaged in other labor work such as waiting tables. After his son was married and the kid was born, the young couple needed a person to take care of the kid. Mother got her fingertip chopped off by a Chinese yakuza who forced her to repay the debt after she gambled all her money away. The custom of severing finger is quite common in Taiwan. That’s why she stays at home and takes care of the child. Q: As a mother with a teenage child, I felt a heartache watching the film. I understand that you would like to show your film to all kinds of audiences; but if you were to target a certain type of age group what will your choice be and what will you tell them? Sunny Yu: I wanted to convey that no matter the subject is a family love or love between the couple, the story of love can easily be understood by the people of all ages. I do think people of different ages, cultures and countries are able to feel the real love and emotion depicted in this film. The reason for depicting these youngsters were because of the incident that actually happened close to my life. I saw a news about a young father who was unable to afford the expenses of raising his child and ended up robbing the other people. I felt that it was wrong to judge him just by the action he took. I wanted to know the reason why the teenage father was forced by the pressure of the society. I wanted to understand these teenagers. Q: Which age group will you invite for your preview screening if you had only one choice? Will you choose high-school students, house-wives or elders? Sunny Yu: If I really had to choose, I would choose the adult’s point of view so that the audience can understand what the child is thinking. Q: The film showed sweet-and-sour experience of the teenager and the cruel reality that they had to face. What were your intentions to edit out the part in between? Sunny Yu: Yes I didn’t depict that part in the story on purpose. It was because I wanted to show the audience how they knew each other and how their love developed. That was the most beautiful part of their relationship. And then I skipped the part in between where the youngsters were having the baby and directly jumped to the harsh reality and difficulties that they had to face and deal with after the child was born.